Consumer unit or just a fuse board is a most important element of any electrical installation, whether it is domestic or commercial. 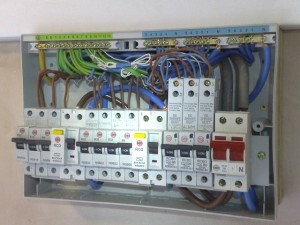 Fuse board includes a set of fuses, the main power switch and RCD, etc. Fuseboard and fuses is totally transformed in recent years, it’s because manufacturers continue to improve the individual components, changing regulations and standards and all this in order to ensure optimal security inmates. 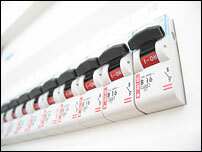 Currently consumer units and individual elements, such as RCD, MCB, RCBO are completely different than, say 10 years ago. In many homes the installation has been changed to the new in 2008 when the UK came into force on 17th Edition, changed not only the colors of the cable but the standards for fuse boxes. It is highly recommended to adapt the existing consumer units to existing standards, especially in terms of safety. If your fuse board has for example 4 years, does not require the complete replacement, but modified to provide maximum protection in the event of a short circuit or electric shock. But now the whole fuse boards, armed with relatively little cost, and being careful about £ 30-40 you can instead of the old box after working, have a new 100% in new current standards units.